The most important thing I did this year, book-wise, was to publish “Secrets in the Fairy Chimneys”. And the most important lesson I learned was that you can’t fool around when it comes to editing. One of the low marks self-published books receive is for the quality of the editing. There is an industry standard. The Chicago Manual of Style is what book editors use. Your friend who worked as a magazine editor, or your English teacher buddy probably won’t produce the clean results you want. You need someone working in the industry NOW. I used the editor provided by my publishing house . The proof is in the pudding. The screech of iron wheels against iron rails trilled through my body, making my teeth ache. I tightened my knees against the large art portfolio as the New York City subway train lurched through a turn, slowing towards the Spring Street station. Not able to control my nervous energy, I left my seat and headed for the sliding doors. I balanced the precious portfolio between my knees and looked at my reflection in the door windows, checking for obvious defects in my appearance. Boy, I thought, You are nervous, girl. Let’s see. I looked at my aunt Jill with utter disbelief as she thrust two ferry tickets at me. I had a large suitcase in each hand, my roller blades slung over my shoulders, Aunt Jill’s tennis racket under my arm, and the car keys she had given me to hold a minute ago between my teeth. I muttered my protest, finding it impossible to get my tongue past the car keys. What came out was more drool than intelligible language. Finally, she looked up from the purse she was digging in to see what the trouble was. The third exciting book of the Annie Tillery Mysteries is now live, soon to be available on amazon.com. 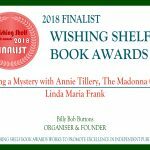 Award winning author, Linda Maria Frank, has created another page-turning, can’t-put-it-down mystery. After clicking on the Authors Show website (Children’s), be sure to select Frank’s interviews from the menu on The Authors Show website, “The Madonna Ghost “or “Girl with Pencil, Drawing”. images (7)On Dec. 21, 1988, Pan American flight 103, originating in Frankfort, Germany landed at London’s Heathrow Airport, and after loading passengers and luggage, took off for New York’s JFK airport at 18:25 p.m. At approximately 19:02 p.m. air traffic control lost contact with it. A few seconds later the radar showed the plane’s blip on the screen fracture into five separate ones, trailing away from each other. The plane had exploded and the debris rained down on the Scottish town of Lockerbee. 243 passengers and 16 crew, dead, as well as 11 residents from Lockerbee. This was one of the most famous plane crashes in history, both for the horror it was, the subsequent political implications, and the forensic investigation that ensued leading to the arrest and conviction of one of the terrorists involved. The USA’s FBI, and the British equivalent of our NTSB, the Air Accidents Investigation Branch, laboriously collected every piece of wreckage from the plane, and pieced together the smithereens they found into a whole plane. Get the latest updates on books, events, signings and more. Learn a little bit more about Annie Tillery and her adventures beyond the books.